Programmers Look For "Summertime Song"
Nashville, TN -- Singer/songwriter Mike Aiken brings a hot twangin' number to Country radio today with his latest single, the "gotta ditch the real world" sing-along "Summertime Song." Aiken says with a grin, "It's a fun tune about playing 'hooky' from life. Sometimes you just need to take a break." Co-written by Aiken and Tim Buppert ("She's Sure Taking It Well," "Another Nine Minutes"), the track literally sizzles with life and features guitar runs by Aiken and the talented Dan Baird (Georgia Satellites). It's the perfect segue from a dreary winter to the brighter days of spring, and programmers will find the tune on their CDX Vol. 567 (track #14) today or can access the track digitally from CDX by clicking HERE or via AirplayDirect. 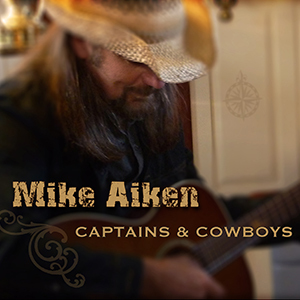 The story behind "Summertime Song"
"Summertime Song" is the first single release from Mike's sixth studio album Captains & Cowboys, which is due out April 22 on Northwind Records. The Virginia-based troubadour recorded the disc in Nashville with A-list musicians, including Dan Dugmore on pedal steel (James Taylor, Little Big Town), Tammy Rogers on fiddle and mandolin (The SteelDrivers), Michael Webb on accordion, bass, B3 (Poco) and Michael Grando on drums (Todd Snider, Chris Knight). Aiken is no stranger to Country radio and its audience: he's enjoyed several MusicRow active singles and has toured the U.S. and abroad. He draws inspiration for his songs from his colorful life: from his self-sufficient days farming, raising animals and shoeing horses to 20 years spent sailing and living aboard his sailboat as a licensed USCG captain. Fans can pre-order their autographed copy now at www.mikeaikenmusic.com.